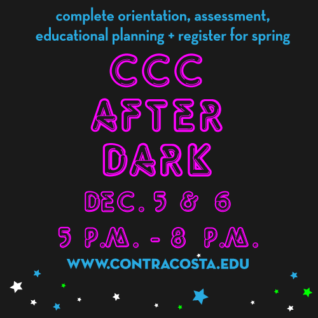 This is a great way for new students to join the CCC family! Over two evenings, we’ll help you do everything you need to start classes in January. You can fill out an application the first night, then come back the next to complete your assessment, orientation, and educational plan–even register for classes! We’ll be here to help out each step of the way. And all of our student services are staying open late to lend a hand. We’ll also have pizza, music, Spanish speaking assistance and child care available for those who attend. You can get more information and RSVP over at Eventbrite!